Bundle Up! : Whether you are on the sidelines or one of our brave participants running into the blistery cold water, it is vital to stay as warm as possible. 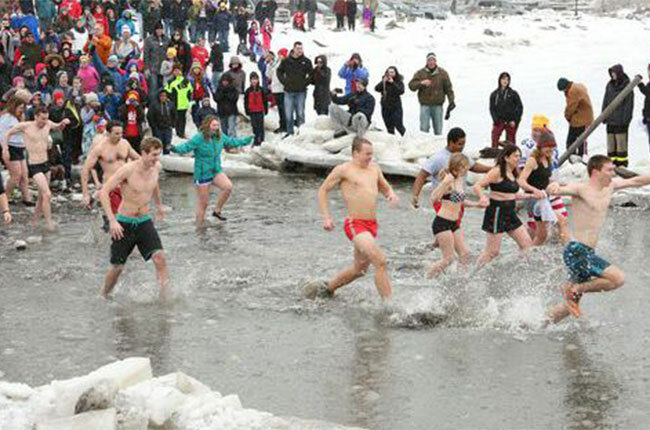 We recommend wearing lots of layers, hats, scarves, gloves before and after your plunge into the water. Wearing a hat into the blistery waters is highly recommended. Protect those toes! : Not only will the water feel freezing on your toes, but the rocks and debris at the bottom of the Hudson River can be sharp on your feet causing cuts and scrapes, we strongly recommend wearing water shoes. Buddy Up: Just like Penguins mate for life, make sure you have a buddy to face those cold waters! Look out for others during the plunge to ensure both of you are safe throughout the whole adventure from beginning to end. Stay Dry! : Make sure you bring and extra set of warm clothing to put on after you’ve dried off from the plunge. Don’t forget to bring warm dry shoes, dry hat, dry gloves!! We hope you’re ready for the plunge and we look forward to seeing everyone at Memorial Park in Nyack on March 5th at 12pm! All rights reserved © 2018-2019 Penguin Plunge, Inc.